I am a member of the Collective Bias® Social Fabric® Community. This shop has been compensated as part of a social shopper amplification for Collective Bias and its advertiser. As always, the opinions and the recipe contained in this post are entirely my own. Many people think of hash browns as something that is strictly for breakfast. Growing up, my mom used to use hash browns or cooked tater tots in our homemade tacos. We all loved them, especially my brother and me. While I thought it was added to make the tacos more special, I didn't know until much later that my mom actually made our tacos with hash browns or tater tots in order to stretch the meat in order for us to have more food to share. Because meat was expensive on a budget, adding potatoes were a good alternative to have more food to feed your family. To this day, I love tacos with added hash browns or tater tots. Not only does it remind me of my mom's tacos, but it adds some additional flavor as well. Last weekend, I did some grocery shopping at Walmart and picked up a bag of Ore Ida's frozen and shredded hash browns. I found them in the fozen food section and as I was wandering through picking up some other groceries, they were having a demo featuring Ore Ida hash browns. The man demoing the food also gave me a recipe card for Mexi-Taco Hash Browns, which is easy to prepare and a good weeknight meal to serve your family. Below you will see some images I took, including the recipe that I received at the demo. You can also see the recipe here at Ore Ida's website. The holiday season is one to spend with family and there are several recipes that are fast and inexpensive to prepare that you can share with your family. 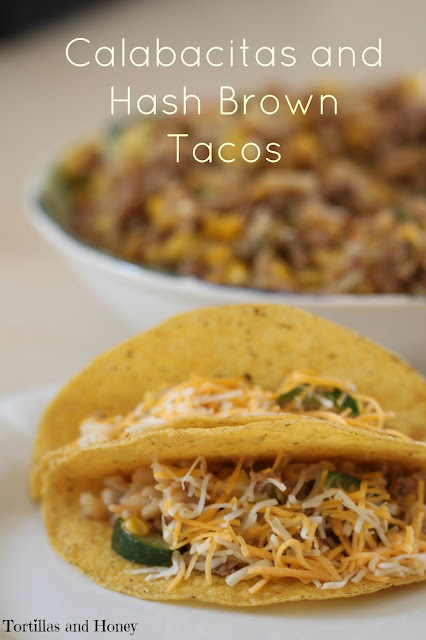 This recipe I've created using the hash browns that I purchased over the weekend is inspired by my mom's tacos using hash browns; that way it's relatively cheaper than all meat tacos but also stretches the dish in order to serve more people. The flavors of the dish are not the traditional tacos that you may typically think of, but are also inspired by the flavors of New Mexico and New Mexico's traditional calabacitas dish. Calabacitas means squash in Spanish, but in New Mexico it's often referred to a dish that is comprised of squash, zucchini, corn, and green chile). If you're having guests over for the holidays, please share with them a homemade meal! This recipe is fast and relatively cheap that feeds many, so that you can prepare your guests a homemade meal but also have enough time to spend with them as well without spending a lot of time in the kitchen. Check out Ore Ida's website to find out more information and to enter their Frozen sweepstakes where you can win one of several prizes, including a trip to Atlantis in Paradise Island, Bahamas for you and your family! In a large skillet, heat the olive oil on medium heat. Add in the diced onion and cook until translucent. Add the ground turkey to the onion and cook stirring frequently and breaking up the meat. When the meat is nearly fully cooked through, add in the zucchini, squash, frozen corn, hash browns, and green chile. Stir together and cook for an additional 5 minutes until the vegetables are soft and the turkey is fully cooked. Add the taco seasoning and the water and stir. Cover the skillet with a lid, reduce heat, and let simmer for about another 5 minutes until the mixture thickens slightly. Check seasonings and add the salt if needed or more taco seasoning or other seasonings that you may like. Let mixture cool slightly, then stuff mixture into taco shells and top with shredded cheese and hot sauce. Add additional topping that you may like, like lettuce, onions, more green chile, avocados, etc. I love these tacos! Usually I put the hashed brown beside the tacos. I love how they go inside the tacos here along with all the other great ingredients. Great looking tacos!